Avatar 2 will finally begin production on September 25th, 2017 after years of speculation and delays. The sequel to the highest grossing movie of all time has been delayed 3 times after it was initially supposed to hit theaters in December of 2014. Due to the previous delays, many began to speculate if director James Cameron would delay again, but production is really going to start up next week, just 5 days shy of October 1st. The announcement was made at the special Terminator 2: Judgement Day screening last night by Cameron. The Hollywood Reporter was on hand and Borys Kit's Twitter account shared the news of Cameron's big reveal that Avatar 2 would begin shooting next week. Cameron also dropped another bombshell on the crowd when he announced that Linda Hamilton will be jumping on board the new Terminator reboot along with the already announced Arnold Schwarzenegger. Cameron is about to get really, really busy next week with the production start of Avatar 2. The director previously announced that Avatar 2, 3, 4, and 5 were going to be shot at the same time, which will be a massive undertaking if Cameron can pull it off. Cameron and the sequel's cast have been running through the motions in the movie's "virtual" sets in preparation for filming over the last several months. Since virtually all of the Pandora scenery in these sequels will be brought to life through digital imagery created by WETA Digital, the director has been taking extra time to get a feel for how to light and position his cast on-set, before rolling camera in what seems to be an almost obsessive way. Sam Worthington, Zoe Saldana, Sigourney Weaver, and Stephen Lang are returning for Avatar 2, with newcomers that include Oona Chaplin and Cliff Curtis. 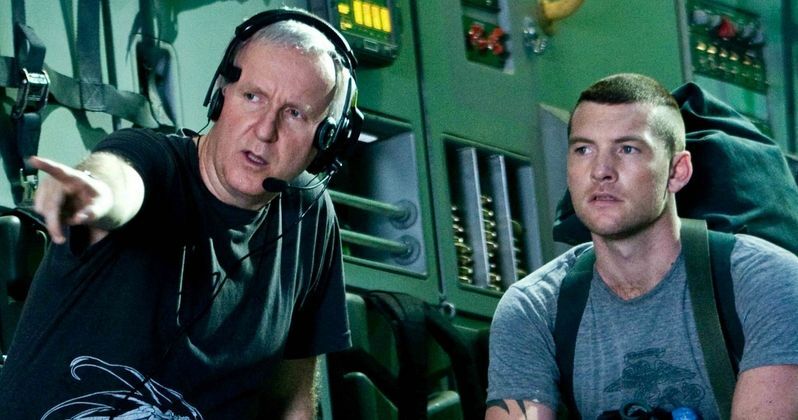 James Cameron has said in the past that the next 4 Avatar movies will take up the next 8 years of his life while also mentioning that the movie had become his day job and now it's apparently time for the director to jump into the 24/7 mode of the project. The sequel is expected to hit theaters in December 18th, 2020 with the additional follow-ups releasing on December 17th, 2021, December 20th, 2024, and finally December 19th, 2015. As if that weren't enough, Cameron is expected to begin producing the Terminator reboot in that time frame as well. The first Avatar movie came out in 2009 and grossed over $2.79 billion dollars and went on to win three Academy Awards in 2010. So, it's completely understandable why James Cameron might want to take his time to get everything exactly how he envisions it as he competes with himself. In addition to the financial and accolades aspects, Cameron and WETA are expected to revolutionize the 3D and special effects industry as well, which is obviously no small feat. There we have it, Avatar 2 officially begins filming next week as well as presumably the rest of massive undertaking of 3 more movies.